The climate is very warm and the ocean levels are still high. The Baltics and Finland are intermittently under a shallow sea. Baltic amber forms. 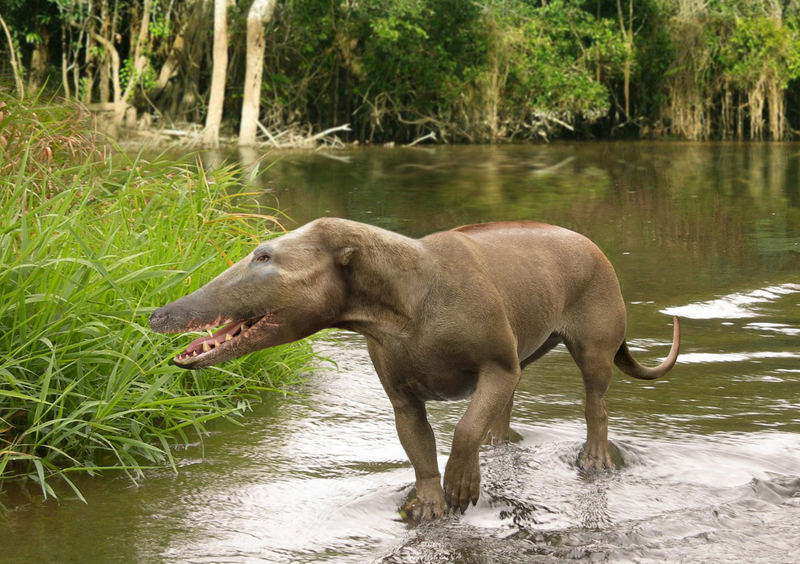 A lot of new mammals evolve, such as hoofed animals. Pakicetus, a wolf-like progenitor of whales, lives in Asia. The climate was during eocene 56-34 millions year ago a warm green-house climate, with no glaciers anywhere on the planet. Epoch started with a very fast and narrow temperature peak that was probably related on anomalies in atmospheric greenhouse gases. At the end part of the epoch climate started to cool. 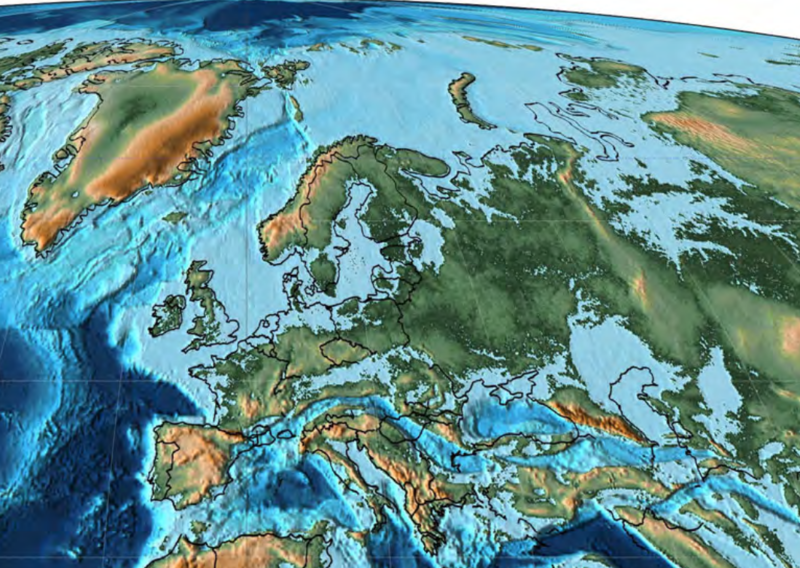 Sea levels were still high and the Baltic and Finnish areas were repeatedly under the sea. The Baltic amber that formed from the conifer resin originates from this time, from about 45 million years ago. Intact insect fossiles can be found from the amber. The Alps rised as Africa collided with the Europe. The land bridge between North America and Europe, via Iceland, breaked, and the sea connection opened from the Atlantic to the Arctic Ocean. The rich flora and fauna spreaded towards the higher latitudes, with tropical and mangrove forests growing up to the European level. Fruits developed to large and juicy forms. Also large nuts appeared. The speciation of mammals and birds continued. Over the half of the current orders of birds and many familiar mammal groups existed. Hoofed animals were evolving: Early ancestors of horses appeared and ancestors of whales devoloped from fish-eating Artiodactyl predators. One of the most famous Eocene fossil sites is the Messel Pit in Germany, which was located during eocene in the Mediterranean region. The site became famous in 2009, when the international research group published the finding of a new primate fossil originally founded allready at 80’s. This 47 Ma old fossil was named Ida, with a scientific name Darwinius masillae. It is conceivable that Ida is an old ancestor of the human lineage – although this is not certain, as other researchers place it into the lineage of the Strepsirrhini (lemurs and lorises). Be it as it may, Ida is one of the best preserved and oldest of the primate fossils, and provides a lot of information of the evolution of our lineage. 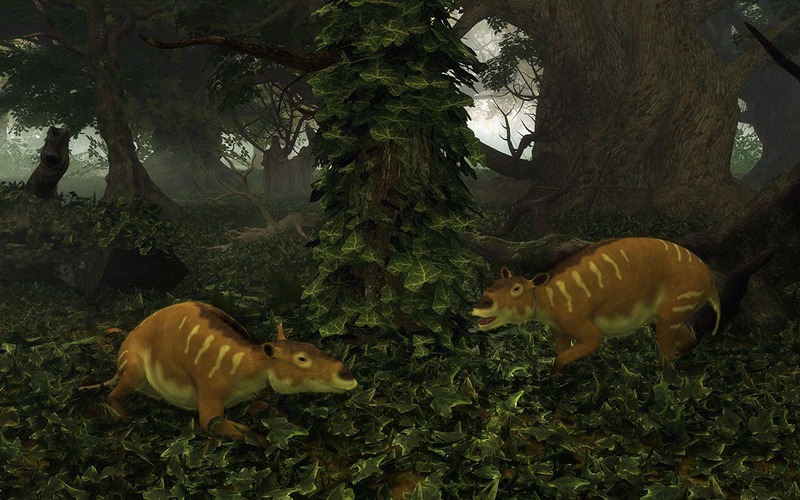 Pakicetus, a progenitor of whales lived 48 million years ago. 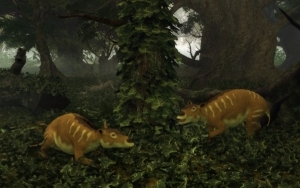 Pakicetus was an early fish-eating ’hoofed animal’.